Are you ready to bust boredom and bring more play, joy, and challenge to your dogs days With rubber treat ball with rope? Bring out your dog’s natural instincts and let them Express their natural behaviors, like chewing, scavenging and working for their food while playing with this treat ball! 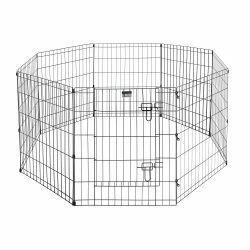 Watch your dog discover new skills how to get over the obstacles to reach his reward. 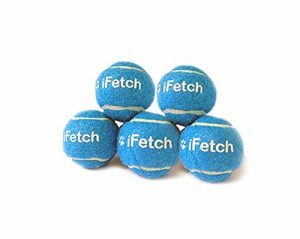 Ball’s Softer sturdy rubber and size L (ball’s diameter – 2.76 inches, total length with rope – 12.59 inches) Makes it perfect dog toy for medium to Large size dogs and for moderate chewers. 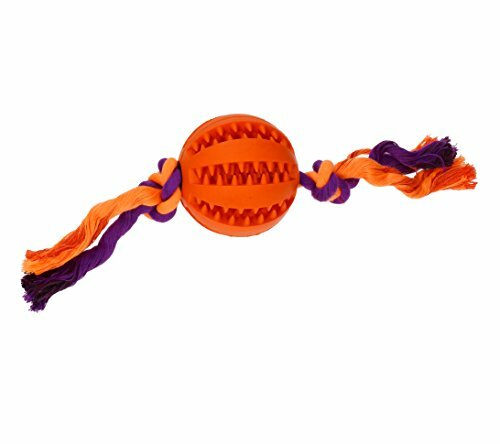 This rope ball is also great for games of fetch as a short cotton rope allows to throw it is easily further. 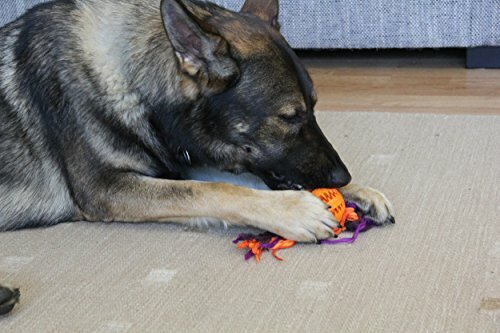 This rope is also good attention grabber for puppies and invites them to light tug-of-war games instead of biting, nibbling or grabbing your hands. 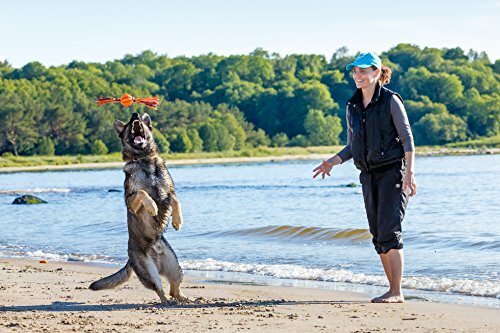 Through different games like fetch or hide and seek you can make the dog training a joyful rewarding and engaging experience for you and your dog. Your dog learns through the play new commands and becomes happier and more manageable, which makes life easier and enrich both of your lives. Exercise creates tired dogs and tired puppies, sleeping dogs and puppies are the good dogs! Give them the stimulation they need by engaging their mind and body in an exercise and mental activity and you’ll have a happy healthy pet. 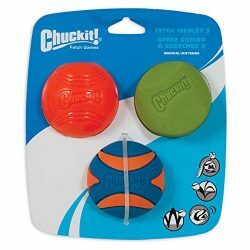 Package includes: 1 rubber treat ball with rope If you are ready to keep your dog mentally sharp and physically in great fit, click add to cart now to find out what you’ve been missing!Do you have a pup with shark-like teeth, who is ready to sink his teeth into anything, like shoes, phones or furniture? 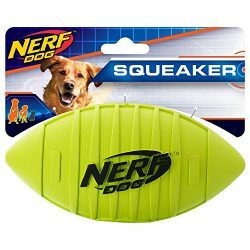 This interactive dog toy is a great way of re-directing dog’s attention back to play with his toys and protect your belongings. Worried of your little furry friend not getting attention? Just hide some yummy goodies between the grooves of the ball and WATCH how tempting scent of Food attracts him to start to work for his delicious reward and keeps him occupied in alone time. 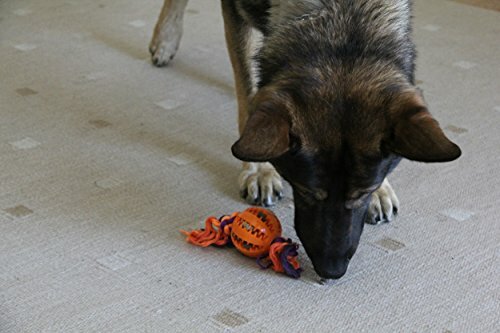 Playing with it is useful to fulfill natural canine urges to grab and pull on things with their mouth, to chew to keep their jaws strong and teeth clean. Little rubber spikes between the grooves massage gently gums and soothe on puppy teething time. 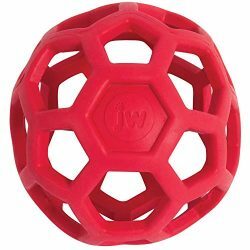 This treat ball with rope is made from soft natural rubber to entertain your pooch without worrying about toxic materials and to bring lots of playtime, Whether your dog plays nose work games or has playful time with chasing, CATCHING or fetching it. Creative playtime Mixed with learning some basic commands makes puppy training fun, strengthens bond between you and pet, increases intelligence and creates happy spirit, which means less destructive behavior and more happy healthy pet.